Invisalign makes it easy to straighten your teeth without bands, brackets or wires. Forget everything you’ve heard about teeth straightening. Because a proven technology now exists that lets you straighten your teeth—invisibly. 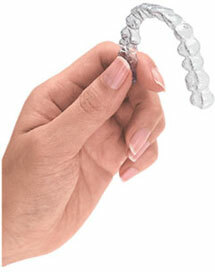 Invisalign is a virtually invisible solution so you can smile during as well as after treatment. In fact, virtually no one will know you’re wearing them unless you tell. By using a series of clear, removable aligners, Invisalign straightens your teeth right before your eyes. Change them about every two weeks and your teeth will move—little by little—toward the smile you have always wanted. Invisalign is comfortable to wear and it doesn’t require you to change your busy lifestyle. You visit us every month or two to check you progression and get new aligners. Average treatment time is only about a year. Because aligners are removable, you can continue to eat your favorite foods wile brushing and flossing normally to keep your teeth and gums healthy. Ask Us How Invisalign Can Work For You. Call us at 919-806-1996 or email us at Invisalign@allisonfamilydentistry.com to set up your free Invisalign consultation. Hundreds of thousands of people have already discovered Invisalign. Maybe it’s time you were on of them. For more information, visit www.invisalign.com.